Late Tuesday night, reports came down that Avi Garcia was pulled from his game in Toledo. This time of year that meant he was in the middle of a big trade rumor and it looks like that came true around 11pm as multiple reporters confirmed that the Tigers got involved in a three team deal that sent Garcia to the White Sox, Jake Peavy to the Red Sox, and Jose Iglesias to the Tigers. Additionally, the Tigers will send Brayan Villarreal to Boston and the Sox will send low level prospects to Chicago. On the surface, it works for everyone. The White Sox get a high ceiling prospect in Garcia, the Red Sox get the starting pitcher they needed, and the Tigers get a SS to fill in for Jhonny Peralta who is, at this point, sure to be suspended this week. The Tigers gave up a young, cheap player from a position of strength for a young, cheap player at a position of weakness. The Red Sox gave up a young, cheap player from a position of strength for much needed pitcher. The White Sox traded a starter who won’t be a part of their future for an OF who could be. This seems like a deal that works for everyone. I’m a Tigers writer, so I’m going to focus on the deal from their perspective. Jose Iglesias is an elite defender at SS and makes the Tigers starting pitchers, particularly their two elite level ground ball starters Porcello and Fister, much better. At New English D we judge pitchers on only what they can control, but it is also important to realize that run prevention wins games, not expected run prevention. The Tigers as a whole got much better at preventing runs with the addition of Iglesias, even if it doesn’t actually change anything about the pitchers themselves. Porcello and Fister are very good pitchers, but their ERA’s will be helped a great deal by a player like Iglesias who will swallow up baseballs that Peralta couldn’t. Peralta isn’t a bad defender, but he’s not on Iglesias’ level either. And Peralta is getting suspended. 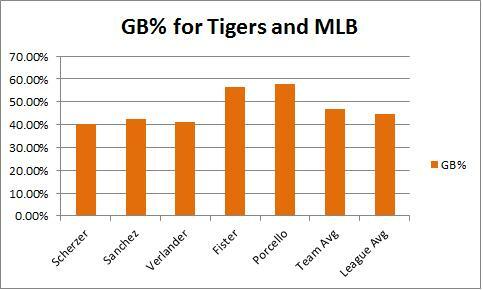 Porcello and Fister are 2nd and 3rd in MLB in Ground Ball Percentage and the team just added someone who can get to ground balls with the best of them. Not only will Iglesias get to more balls than Peralta, but he can also get to a few ground balls in Cabrera’s zone as well that Peralta has been unable to help on. The Tigers traded an OF who isn’t expected to be a player on the 2013 club and doesn’t really have a place on the team for 2014. With Jackson locked in center, Hunter under contract for 2014, and Castellanos twiddling his thumbs in AAA, there isn’t really a place for Garcia right now especially with absolutely no way to find ABs at DH until at least 2015. Garcia may prove to be a better player than Iglesias, but the immediate value Iglesias can bring to plug the whole at SS with excellent defense during a championship run is worth the cost. Iglesias profiles as a guy who could hit, but might not. He started hot this season but has cooled off this month. As long as he can provide something more than Worth or Santiago at the plate, it isn’t even worth talking about and Brayan Villarreal barely registers as a cost to the team. Iglesias is a great defender at shortstop who won’t be a free agent for five more years. He’s 23. Garcia has a higher ceiling, but has plenty of risk too. This is the move you make. It’s the most Dave Dombrowski move since he traded for Fister. I like it a lot. Iglesias can pick up some slack for Peralta at the dish, but he’s going to make up the lost value on the other side of the ball. He’s Brendan Ryan but with a reasonably decent bat. And he’s younger. And under team control. Dave rarely rents players. He finds opportunities to exploit an evolving market. He heard the Red Sox wanted Peavy and he saw an opening to grab the SS he wanted. The Sox have Drew this year and top prospect Bogaerts coming. It was a chance to get a player that can help the Tigers now and in the future. Now Iglesias doesn’t have enough big league time for me to do an in depth statistical breakdown, but everything I know about him says the value will be there on defense. Given the alternative, this is a smart move that could be a great move. Defense plays up in October and the Tigers were going to need a SS next year anyway. Dombrowski said he was probably done dealing at his press conference Tuesday afternoon, but we all knew that wasn’t true. Dave doesn’t stop, he lurks. He waits. On Tuesday he grabbed a SS who makes the team better without paying too much. That’s a tough thing to do in a sport devoid of shortstops. Maybe Garcia becomes and All-Star and this looks foolish in 2016. But it’s a gamble you take because, despite how much of a cliche it may be, flags fly forever.